On behalf of the Conference Chair (Prof. K.M. 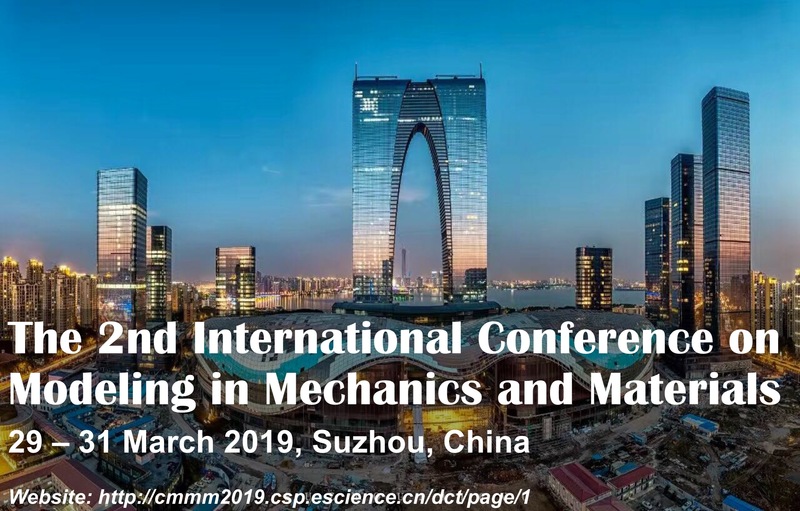 Liew), I am very pleased to announce the 2nd International Conference on Modeling in Mechanics and Materials will be held from 29 - 31 March 2019 in Suzhou, China. This conference aims to provides a platform for academia and professional communities to present recent advances in modeling of aerospace, biomedical, civil, electronic, ocean, offshore, energy, mechanical, robotic and control engineering systems, both in small-scale and large-scale, with multidisciplinary applications, focusing on understanding and predicting material behaviors through modeling. The call for paper and other relevant information is available on the CMMM2019 website. Specific information on the accepted minisymposia can be found here. All accepted paper will be submitted for publication in IOP Conference Series: Materials Science and Engineering. Furthermore, selected papers will be submitted for publication in International Journal of Applied Mechanics, International Journal of Structural Stability and Dynamics or Composite Structures.